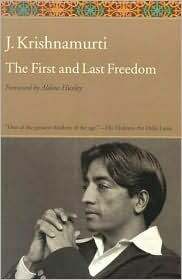 The First and Last Freedom is a 1954 book by philosopher and spiritual thinker Jiddu Krishnamurti. Writer Aldous Huxley wrote the forward and described well what this complex book is all about: “The fundamental theme is developed by Krishnamurti in passage after passage. 'There is hope in men, not in society, not in systems, organized religious systems, but in you and me'” (12). In this book, Krishnamurti first explored this hope in many contexts (self-knowledge, belief, and desire to name a few) and then spent over half of the book dealing with questions about his writings. Reading this book took a lot out of me. I had to pay strict attention to every word in order to get a firm grasp on the content. Krishnamurti's writing challenges conventional ideas about human thought in a similar fashion as when white people read The Autobiography of Malcolm X or when men read Backlash. If you cling to ideas about anything (nationalism, politics, religion, social status, the past or future etc. ), you are part of the problem that prevents humanity from being at free and at peace because you do not see things in reality for what they are; you are just seeing things as you want them to be. Here are some of Krishnamurti's thoughts on belief. Krishamurti it attempting to show that each person is both the cause and the solution to the problems and issues that plague humanity. It is only when we take stock in ourselves as individuals and see reality as it is that we will move forward in freedom and peace. There is so much more in this book and I could go on for a long time with passages and reflections. It has really forced a shift in my thinking regarding human potentiality and power.